Thank you so much for all the sweet comments you left when I told you I wasn’t feeling well. I think I am on the mend now. Today is the first day I have felt well enough to take pictures and post about another of my Christmas gifts. I have been in love with the French zinc bottle racks for such a long time. You can see here where I did a post about the antique ones I found on our trip to Destin last year. I would have loved to bring one of those home on the plane but I knew Delta was not about to allow that…they even confiscated my weapon lipstick one time! The price tags of $500 and up also stopped me in my tracks. Sigh! 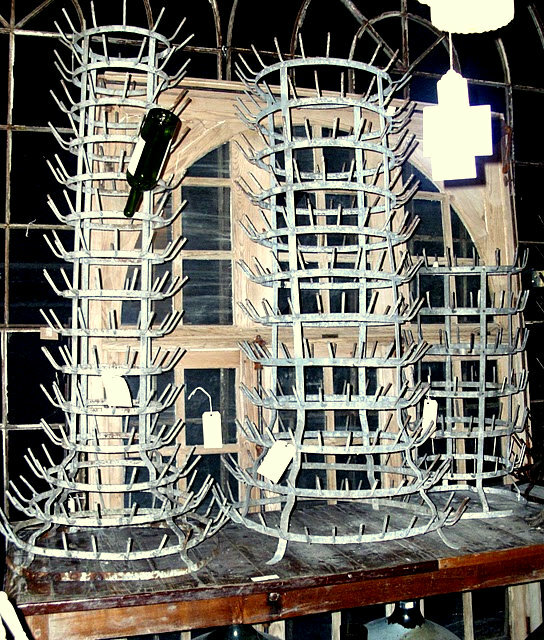 Did you know these racks were originally used in French wineries to dry the bottles on? You can still find them in French homes hidden in the basements where they are holding cleaned wine bottles. I am always telling you what a sweet husband I have. Remember the sterling vanity clothes brush he surprised me with for Christmas? Well, I had left him subtle hints about a bottle rack…the link to LaurieAnne’s Vintage Home on-line store and the words I WANT THIS typed in bold print! I am so happy he got the hint because the bottle rack looks great on our kitchen counter. I have added my collection of ironstone cream pitchers and now I am on the search for a few more. Of course I had to take a picture from the other side. I also want to show you the sweet gift I won from Shell at Bungalow Bling. This is just the most adorable little top hat headband. 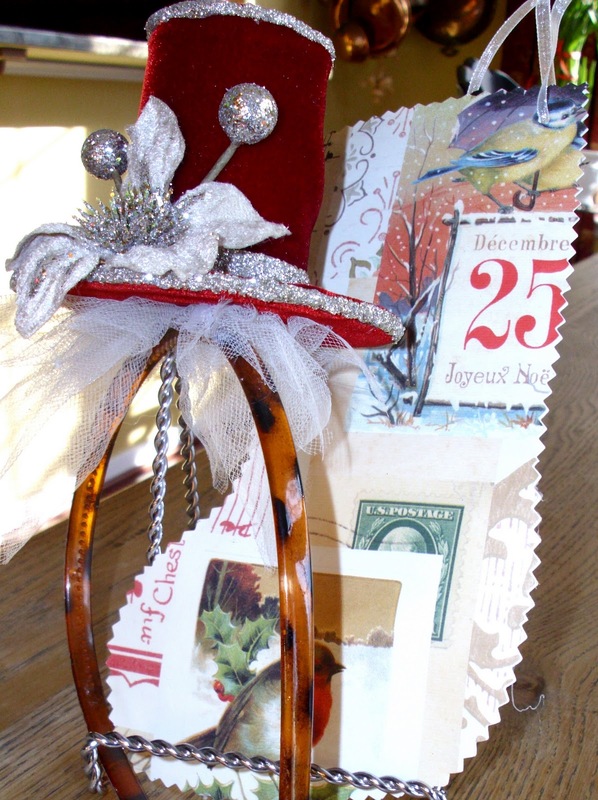 She also included a darling paper stocking that she made . The pictures don’t really show how precious it is in person. Oh…I love how you have it dressed…BEAUTIFUL! I won a drying rack from Ruth at The Beautiful Life! I used it outside…they are so much fun to play with…don't you think! I see your Emma Bridgewater cheese platter in the background. I just ordered on a couple of days ago…love love love! P.S~I am hosting a Giveaway, if you would like to enter stop by for a visit. Sherry, I love that rack. I would love one of those. That is such a good size. Sherry the french bottle rack is amazing. I don't believe I have ever seen one! What a super gift! I love these old zinc bottle racks! Someday I hope to have one, in the meantime I enjoy looking at others. Oh girl I love your rack ha ha!! that now sounds weird nothing it?? if a guy said that to me I would say Thanks ha ha!! Any hoo get my mind out of gutter and move on now..I'm so glad your feeling better my Dear friend.. The rack is great but having a hubs thats gets you what you want is just PRICELESS…mine gets me things like a lamp you would have found at "Sanford and Son" and I have to live with it for 6 months before I can put it in the barn with his other gifts ha ha!! What a great bottle rack! What a smart husband! So happy you are feeling better and how nice of your hubby to get this for you. I adore it and the way you have displayed! 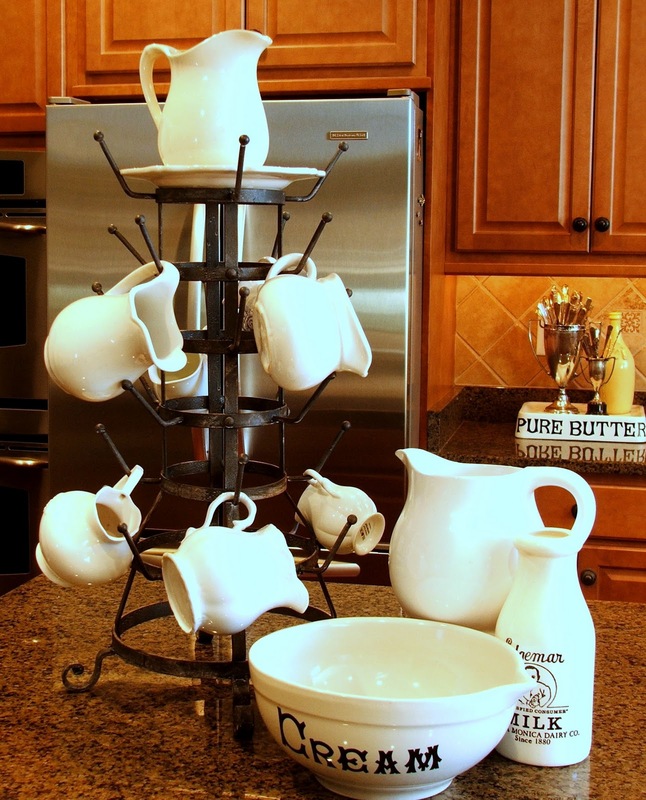 I love that drying rack and your display of ironstone creamers…I want one now! Thanks for sharing. I never knew what the bottle racks were for, so thanks for the education. 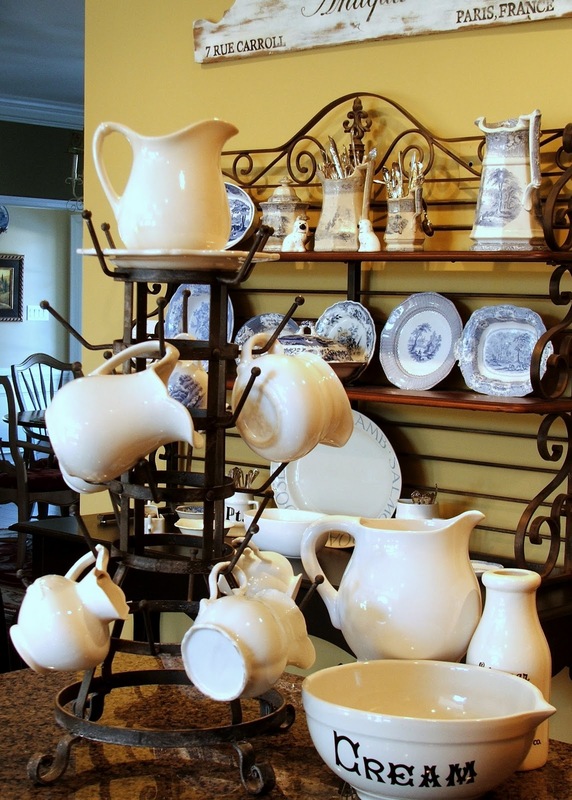 Love the rack on the counter for your creamware. Beautiful! I see them everywhere over here and I want one, but never knew what to do with it. Very nice! Your rack is wonderful, that is the first time I have seen these, so versatile. I really like how you have used yours! Could you possibly share where you acquire all of your white stoneware with the writing on it? I love the pieces in your header and have scoured the internet for them, but no luck! Thanks so much. Love that bottle rack! It looks great in your kitchen. I love the drying rack! !I would love to have that!I also collect ironstone creamers. I did a post today about that too!Your house is so gorgeous. I hope you don't mind if i copy your ballard knock off print.I fell in love with it!It would look perfect in my office. What a great way to display creamers. Now I must be on the look out for a drying rack. That one is perfect. Good husband to take the subtle hint! Your little pitchers look so cute hanging there! I love those zinc racks, too, but I don't have room for one. I love the drying rack and how you've chosen to display it looks fabulous. The size is just perfect for the counter. Thanks for sharing Sherry, this is just a great piece. I've had my eyes on those beauties for a long time also. I see them out at Alameda Point Antique Faire all the time, expensive. I like yours even better than the large ones in the first picture. The scale works so much better and your pitchers look gorgeous. What a wonderful gift. Oh, poor you being sick. But I bet you always feel a little better when looking at your bottle rack! I have got to start leaving hints for my main man! I love those racks — we have one in the garden which does hold wine bottles — how nice of your husband — your pitchers look really good on them! I love your little rack and the great way you are using it in your kitchen…good idea! Your drying rack is beautiful!!! Hi Sherry! What a marvelous piece! I would love to have one of these! Hope you're feeling all better soon. Love the bottle racks you found in FL. I do like the one you got for Christmas much more. It is more useful and to scale for most our houses. .
Those drying racks are gorgeous. I love your husband's present too. I can see using that over and over in all kinds of ways. Love it when they take the hint!!! Oh you lucky girl, well to have such a fabulous husband and to be the proud owner of such a beauty! I heart that bottle rack!! Wow! I love it! First time in my life I see something like those rack!!!! P.S. Your blog is amazing!!!!!! I have never seen one of these but oh my! Lovely…..and it looks perfect with your ironstone cream pitchers! I have wanted one of these for the longest time. I love that yours looks like one of the old ones…so I will have to go check it out. Each time I find an antique they are $300 to start but usually quite a bit more. I love how you've displayed it with the English advertising earthenware…love that 'cream' bowl. What a sweet hubby! I sent you an email a few days back…no hurries in replying, just hope you got it. You have so many pretties. The ironstone is my very favorite. Gorgeous. Such a versatile piece…many uses. I'm sorry you weren't feeling well, and glad to hear that you're on the mend! I'm also glad that your husband got the hint and bought you that wonderful rack for you to display your beautiful pitchers on! Congratulations on your wins as well! I hope the ice is passing you by and that you are staying nice and warm! I love that drying rack too. I have always wanted one for my craft room. It looks cute with your pitchers displayed on it. what a wonderful husband to pay attention and get you something you have longed for. it looks just beautiful with your creamy white pitchers hanging there in your kitchen. Good luck on your hunt for more. Oh my what an adorable sweet gifts. The present from your husband was wonderful too. I like how you use it. Happy White Wednesday. Oh, the rack looks absolutely wonderful!! I just came across your blog, and your insights into home improvement, DIY projects, and overall design are very interesting. Your article about this wine drying rack was especially interesting. I really liked your comments on how to incorporate this design into your kitchen as decor and a functional piece. I am adding you to my favorites. Since you and your readers have a flair for interior decorating and interest in design, we thought you would especially be interested in our custom window coverings. Heritage Window Coverings is located in Huntington Beach, CA and we have a wide selection of treatments to complement any home’s interior design! Any feedback would be appreciated as well. As a special thanks to you and your readers, I would like to offer a 20% off coupon using this code upon checkout: BLG20. Lovely! In case any Central-Virginia folks want a similar (possibly identical–I don't know if we have the same supplier or not…) I have a few left in my shop in Petersburg within The Oak!